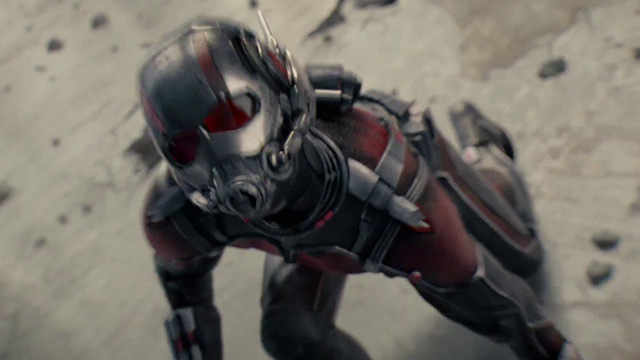 When Marvel released the teaser trailer for Ant-Man earlier this year, it somewhat lacked action scenes and featured a dramatic voice-over embedded in mostly establishing shots. We could hear the tiny superhero's fans gnawing their teeth. Well, Marvel redeems itself by releasing the movie's first (sort of official) trailer—already at 3,811,302 views - and apparently, the additional 30 seconds did wonders! They really outdid itself this time, cramming all essential Ant-Man snippets enough to heighten anticipation but still not play the role of spoiler. In the words of our favorite journalist ever, Borat, "It's-a very nice!" Yep, that's him hanging from a gun barrel. Possibly the smallest fight scene you'll ever see. Who knew ants teaming up to lift a coin can be this exciting.